Malawian peacekeepers in Côte D'Ivoire were key to the success of the UN mission there, known as UNOCI. President Alassane Ouattara (left) of Côte d’Ivoire and President of the Security Council for the month of December, chairs al meeting on peacebuilding and sustaining peace. Mr. Guterres thanked Côte d'Ivoire President Alassane Ouattara, who chaired the meeting, for using his country’s presidency of the Security Council during the month of December to table the topic. 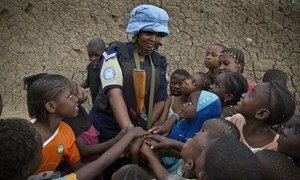 Citing the “encouraging progress” achieved by United Nations peacekeeping operations in Africa – which hosts half of all ongoing missions – UN chief António Guterres on Tuesday called the international community to strengthen cooperation and commitment to peacekeeping, during an open debate held at the Security Council.